whtdragon's tilesets addons, fixes and more! Discussion in 'RPG Maker MV Resources' started by whtdragon, Apr 16, 2016. 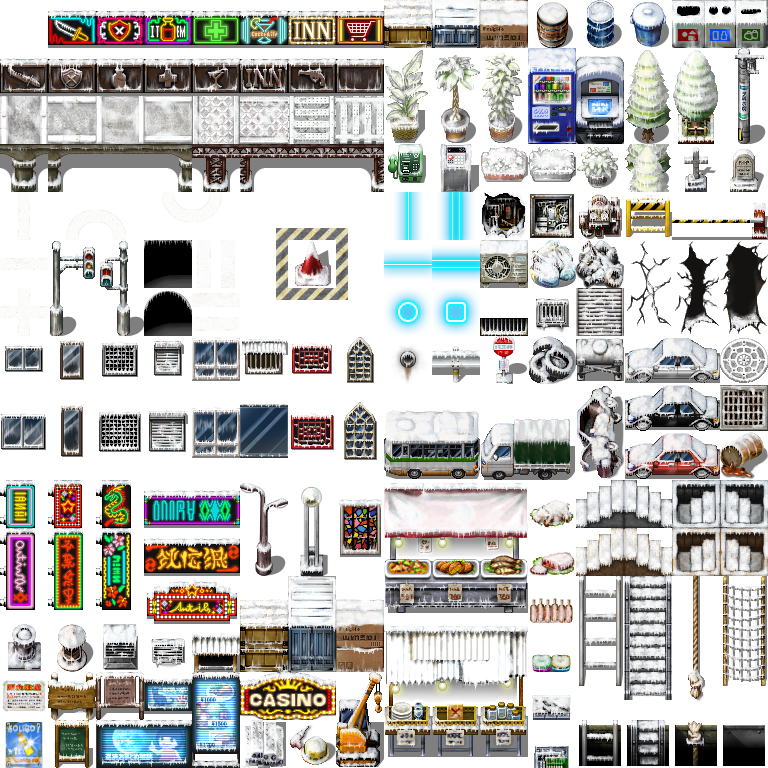 So I've been debating on doing this for awhile, and I'm still not quite sure how to organize this stuff out, so bare with me while I get things straightened out, but basically I've been working on tilesets for awhile in between animal sprites and other stuff, just kind of looming in the backdrop for when I felt like I had enough satisfying things to present. I debated HEAVILY about putting all this in the festivals and celebrations thread but I decided against that because I feel like the focus of this is different from that, and I wanted to keep the festivals and celebrations thread it's own fun lil' thing to update. I'm starting to notice a lot of creative folks working on plugins and sprites for a wide variety of things, and I figure I might as well post some things I feel like folks would logically need next. Some of this stuff is stuff I felt like NEEDED to be added because I'm not satisfied with the small amount of tiles to work with in the defaults, and I'm sure a lot of folks feel the same way. 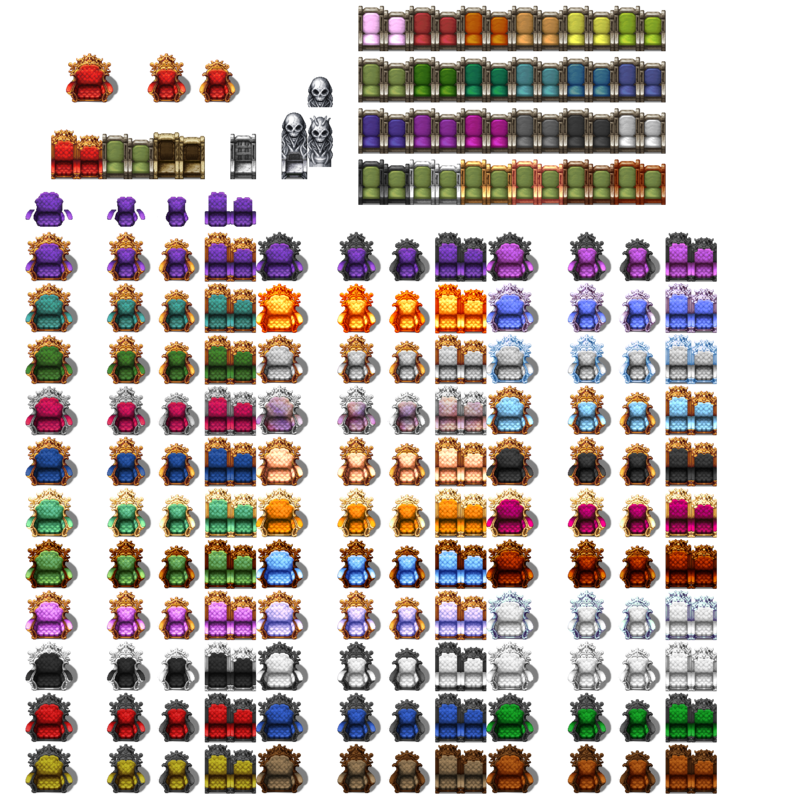 Like almost everything else I do, these are sticking closely to the MV default style, so a lot of it's gonna be recolors, but I will also try and cover some tile fixes and extra filler stuff that have been bugging me since MV was released (and I know some people have pointed them out too) Also if I messed up on anything lemme know and I'll get 'em fixed. I've been working on a ton of this stuff lately, and yes I do have more, coming soon. You are free to edit, change, recolor, re-edit, remix, maim, mangle, add on, divide, and conquer to your heart's content. I don't even mind if you re-upload them elsewhere as it would only mean more people get access to them and that is A-OK in my books. this is now a thing. Two animated waterfall (lavaflow rather) are required for this fix. one for top, one for bottom. 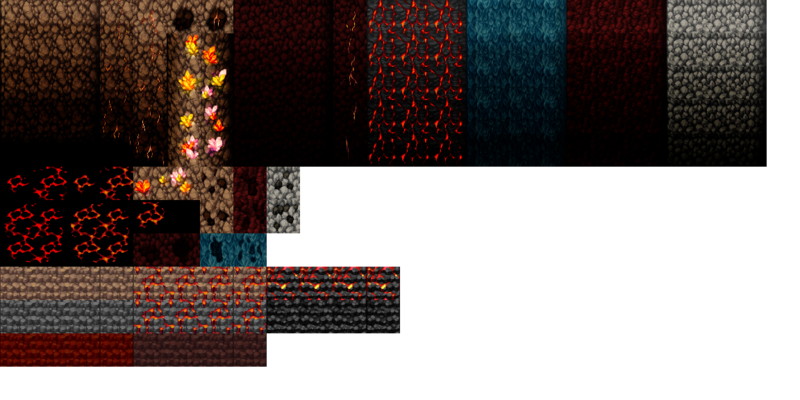 You may find my full new Lava themed A1 tileset with the fix here or in the spoiler below assuming those still work properly. Sometimes things do not have auto-tiles that should, and that makes me a sad dragon. Like leaves. so I did that. More below. 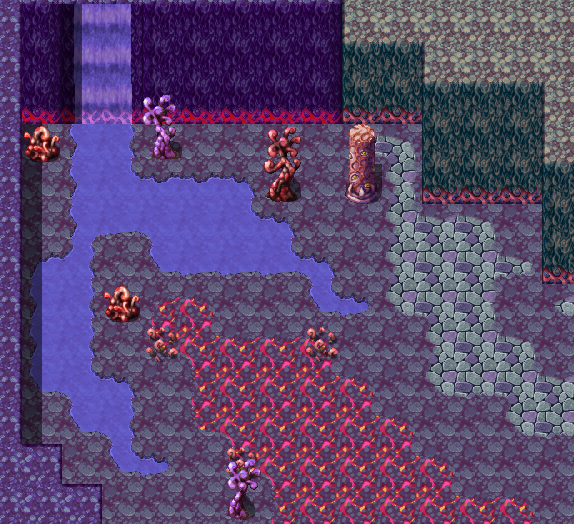 The "Demon World" tiles got a much needed expansion as well as some of the lesser used tiles. I still want to make more for it sometime, but hopefully what I do have now might be useful to someone. I am working on more. side stairs: gotten some requests to do some sideview staircases, so I took the small default ones from MV, and made them much larger, then added ones for grass, sand dirt, wood and stone. 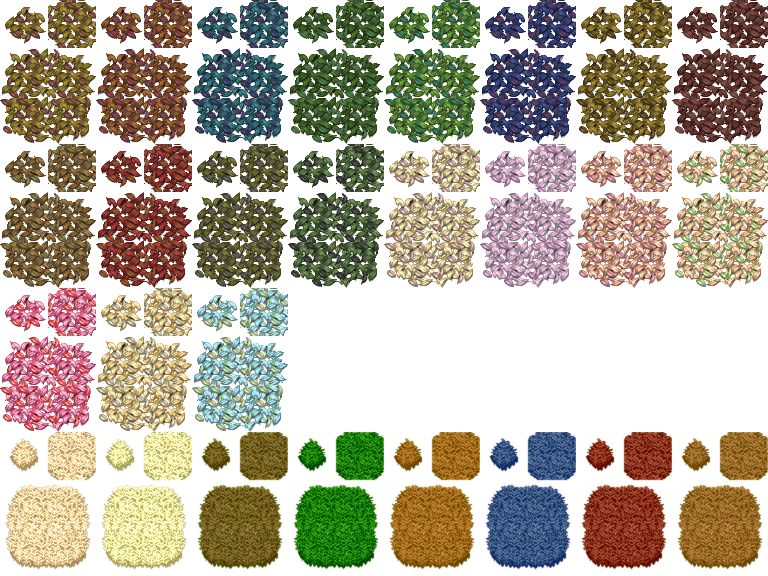 I know there's been several that's already done this, but I also included more of my recolored grasses and volcanic rock. I also included a "base" version so anyone can easily edit. I know there's already a lot of resources for caverns and volcano themed tiles already but I did try to hit on the ones everyone seems to avoid. 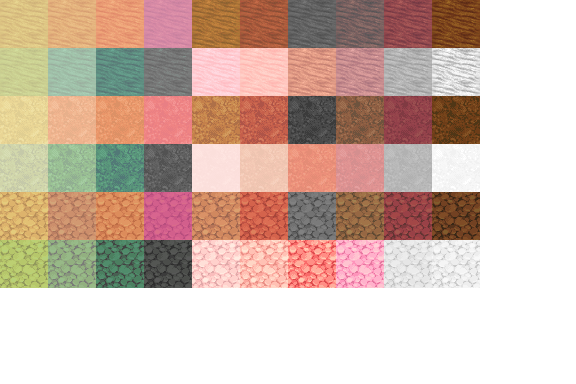 I also made several new more natural tones as well as a lot of varieties for mixed color sets. 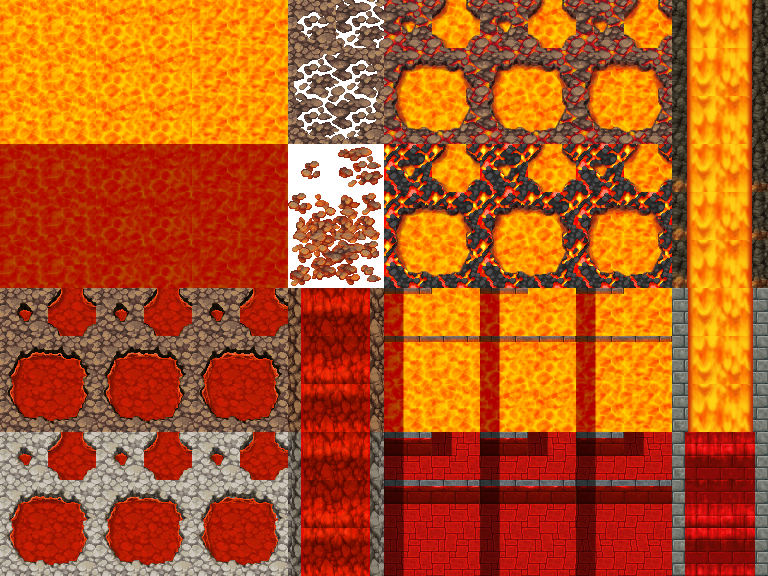 not only did I make a lot of new lava crack tiles for the various varieties of colors, but I've also got "cooled lava" where the lava has cooled down and is now black, and of course, I have also taken the liberty of adding some of the new lava flow animations with the fix, and I made a few "Abyss" type tiles. massive wall/floor tiles. Note this is NOT a tileset. 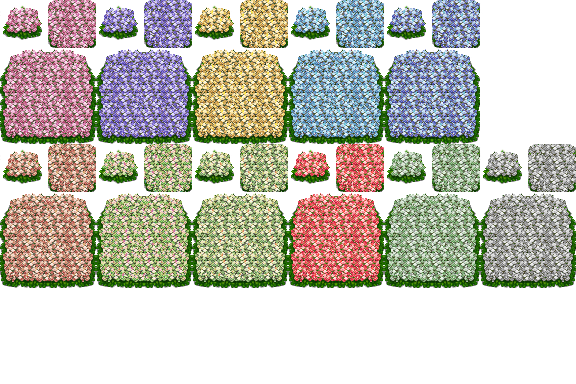 You will need to edit them into your own tilesets for use. "Abyss" tiles and some extra stairs, wall holes. 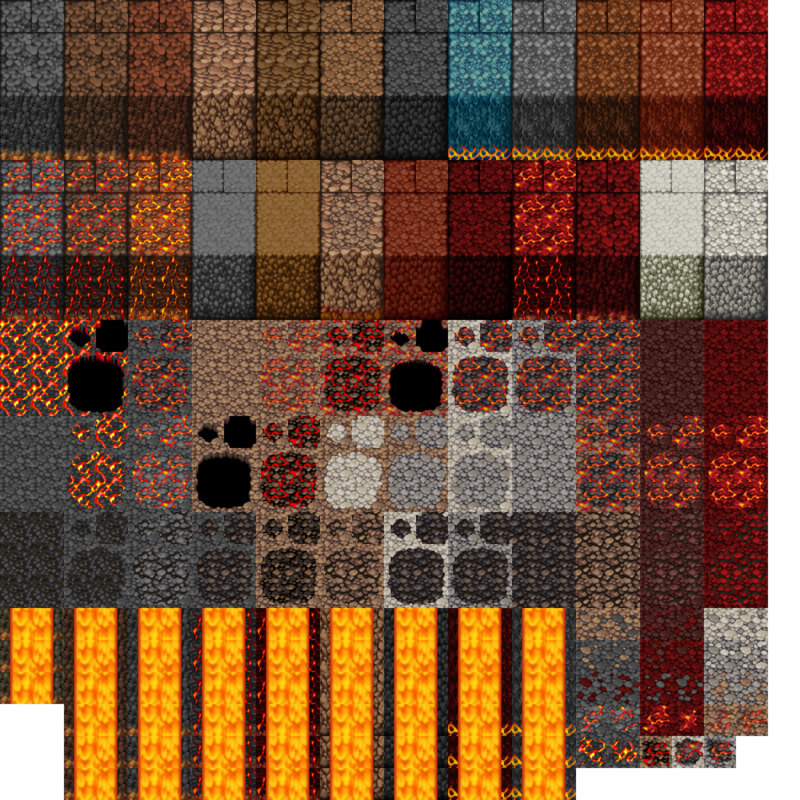 Note there are two lava autotiles. 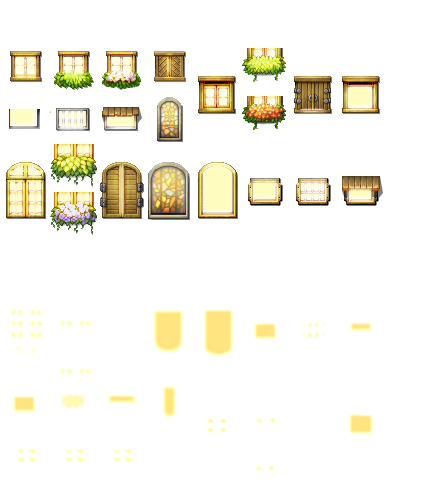 You will also need to edit these into your tilesets for use. I almost added crystals to the other walls too, but mmm I got kind of lazy /- w -; and it'd mean having to make new curved walls for everything and I'll do that maybe later. this is the one I've been holding back the longest and it's been driving me crazy because I kept adding onto it, unsatisfied with it. I'm still not really happy with the set, but I'm hoping other folks are going to use it and play around with it and I know it's going to be massively useful. 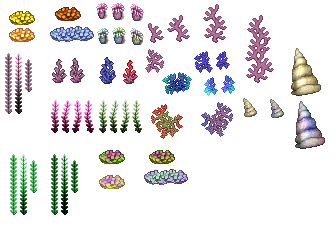 Includes many different colorful types of coral with some basic ocean colored tiles for ruins. Nothing too fancy there. 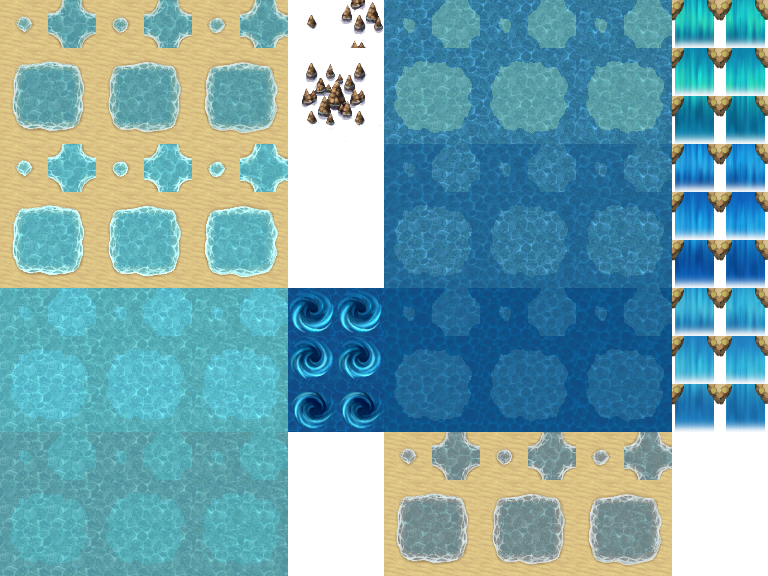 The Ocean tiles are mimicing how XP handled some of the water tiles, I just really liked the tiles layering so I matched it as best I could. Added new ocean tiles! a few basic seabed colored floors/walls with some extra stone pillars. This is NOT a tileset, you will need to edit it. 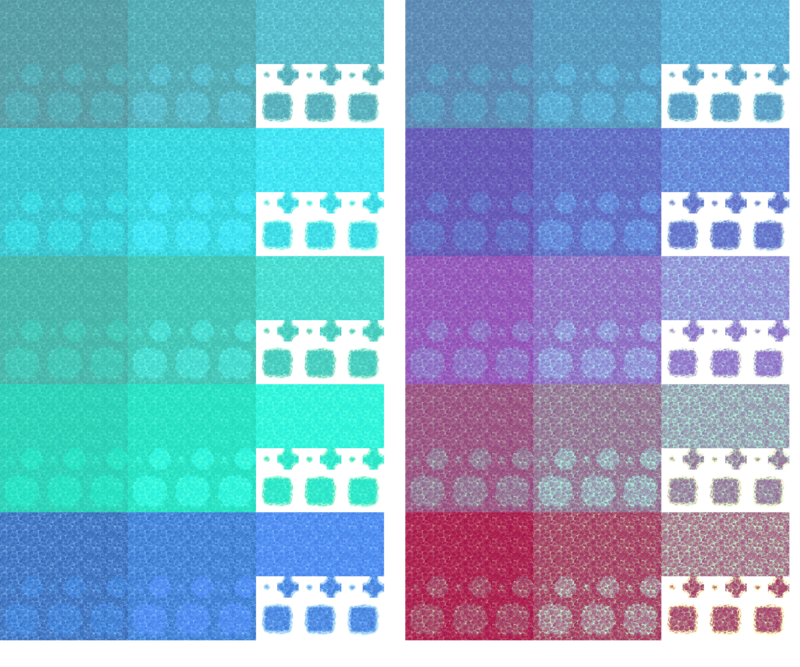 full array of a B tileset, though you will likely end up having to edit it to fit your needs. 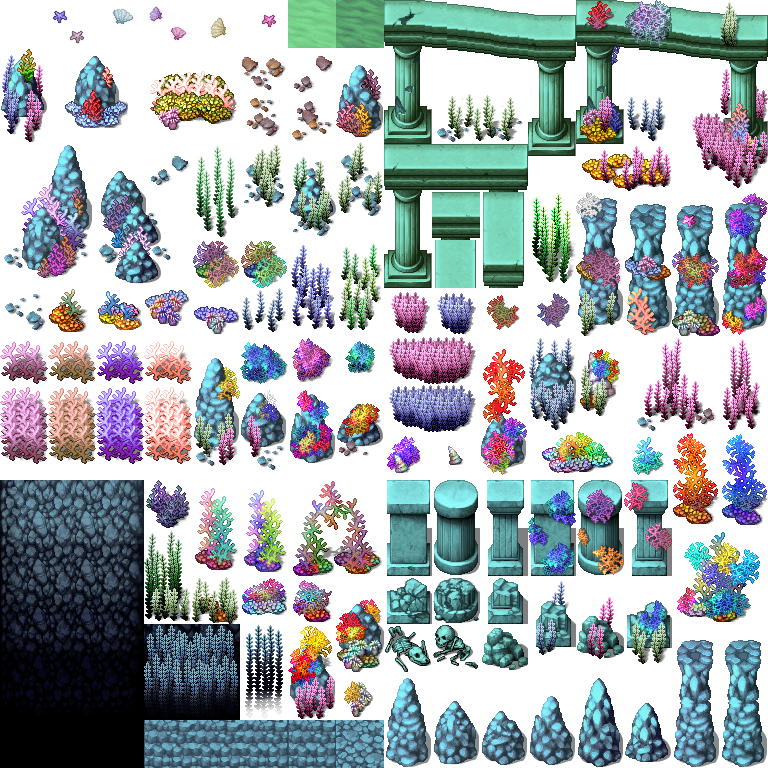 (especially since there's some ground tiles not ment to be put in there oops :x ) still includes lots of coral and seaweed types! Also hope you like colors 'cause that's what we got. new water tiles! Includes new variants of blue and a few more crazy/alien colors. These also have the seashore line without any sand, this is for better customization if anyone is interested in doing that. can be paired with some of ground and sand recolors. currently only have spiderwebs for indoors. I am working on an outdoors version and eventually a cavern and forest version. This includes most major items having some kind of cob webbing on them, and I'm talking big gnarly spiderwebs. 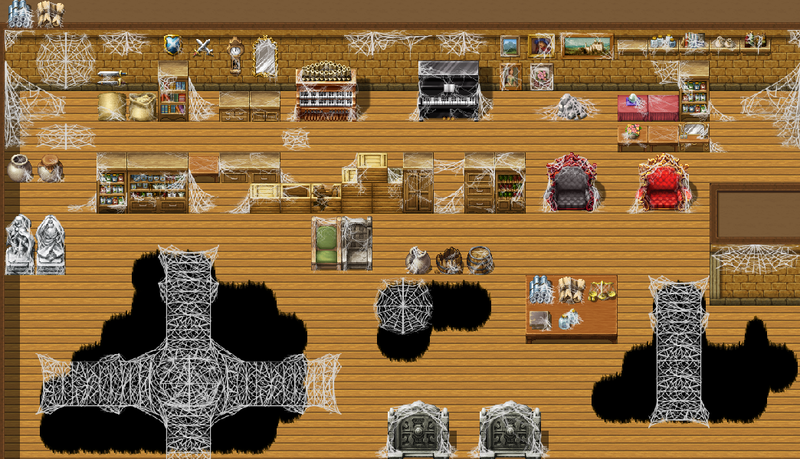 Includes MANY many wall, ceiling and floor webs, as well as most of the shelves, tables, cabinets, and chairs found in the defaults as well as a very basic web bridge. Not all the items from the default have been webbed, but I had an abandoned house in mind and figured most of the valuables and food would have been long gone. Outside spider web tiles are now included! lil' preview of the webs in game. As you can see, the webbing is very gnarly, almost over the top. Perfect for spider monsters or cinematics. 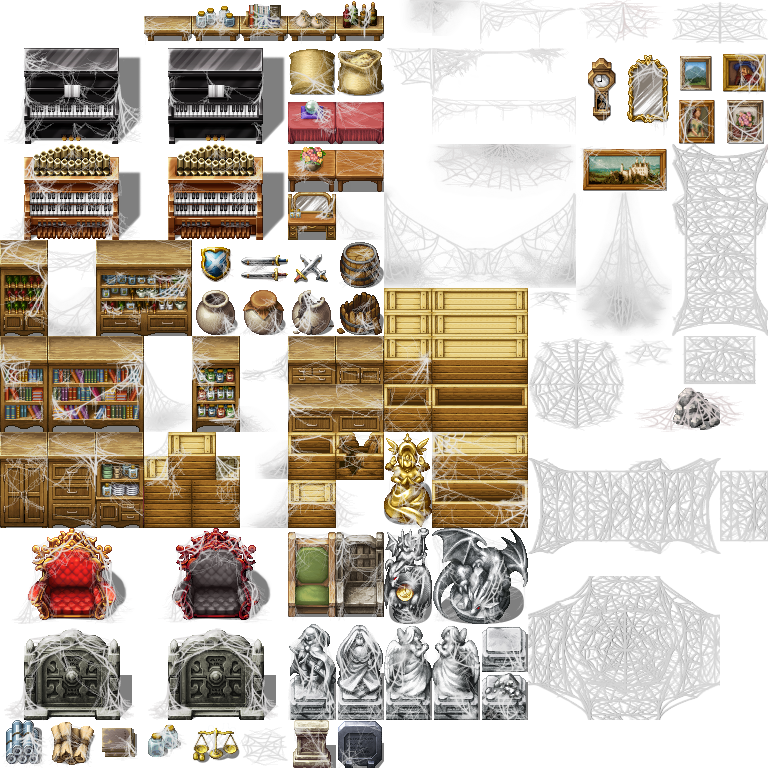 outside tiles full of spiderwebs o w o/~ this IS a nearly completed B tileset. I might add on to later down the line. It is ment to be an extension of the base outside tiles but could also be used with the indoor webbings for extended web use. Added new damaged windows too and an extended sign post. 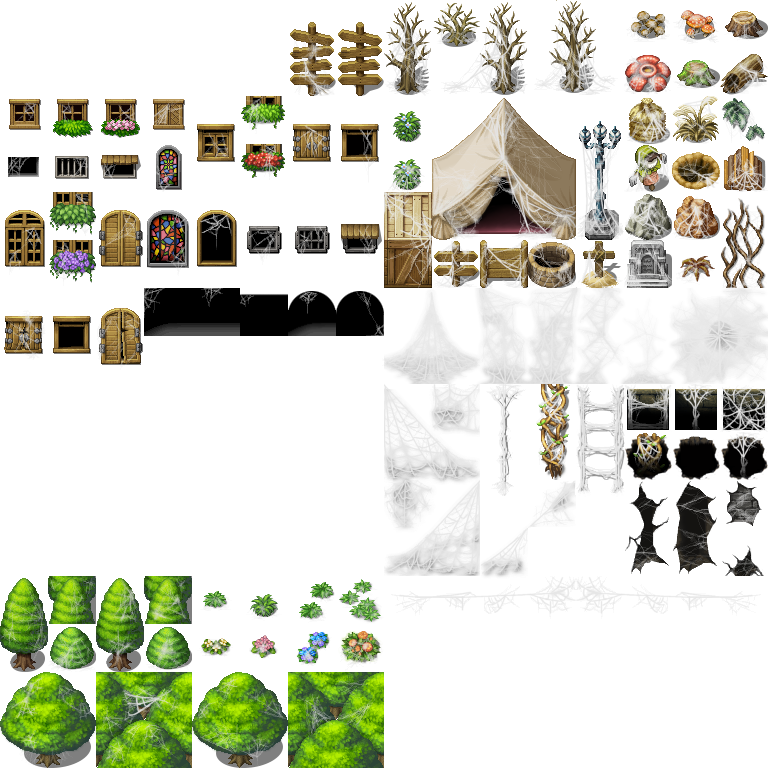 The tilesets that no one asked for lol when I opened up MV for the first time, and was looking around at the various tiles I was very much not happy that there was so few assets and items for other tiles that wasn't your typical fare of forests and villages. 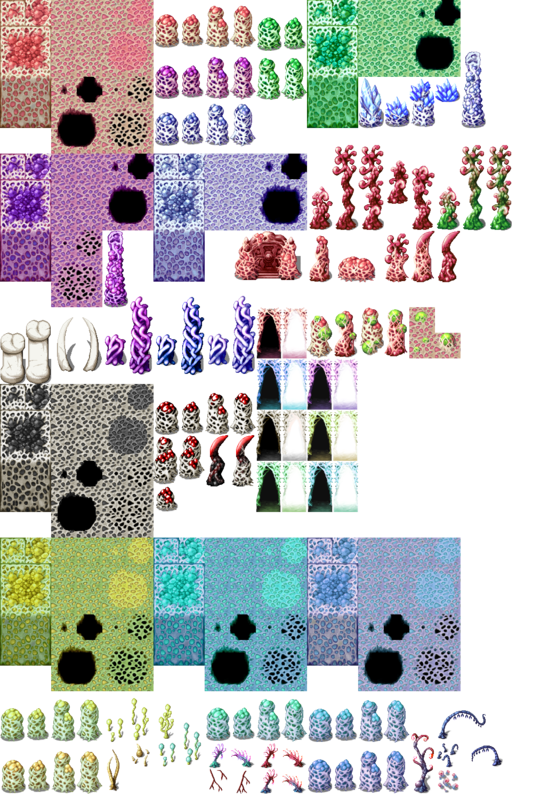 Here I have given the demon world tiles a whole new set of ground and wall types. 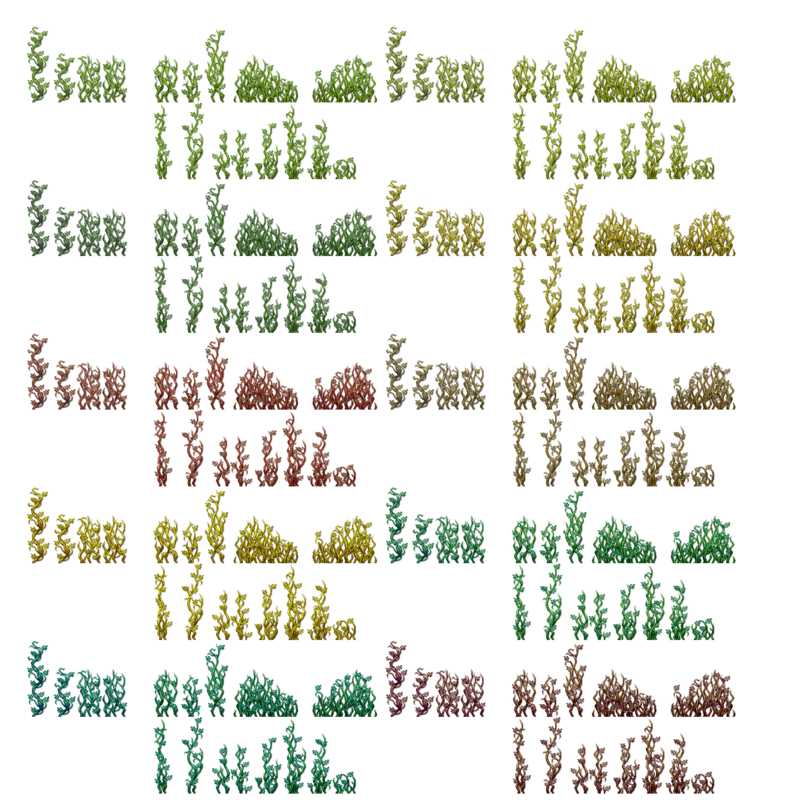 Most of which are recolors. 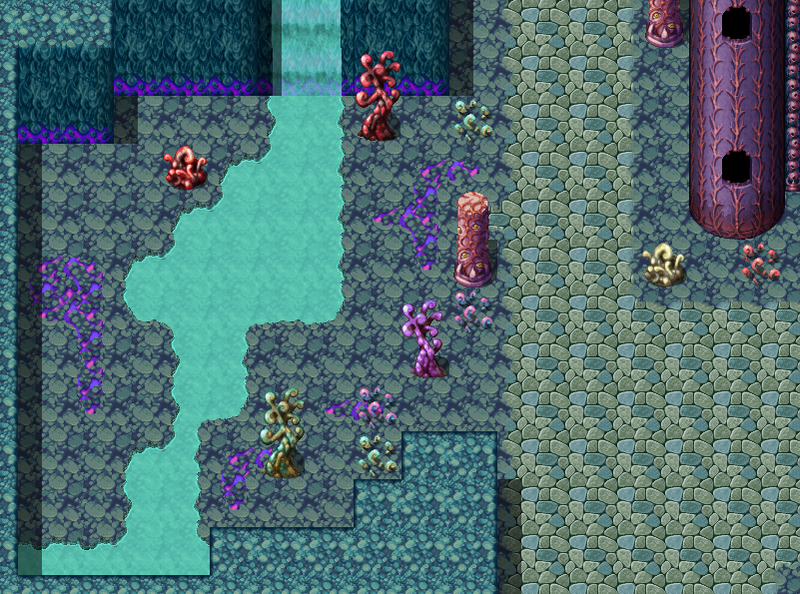 When I was working with the tileset, I had in mind an almost beautiful alien world where the various monsters originated from. 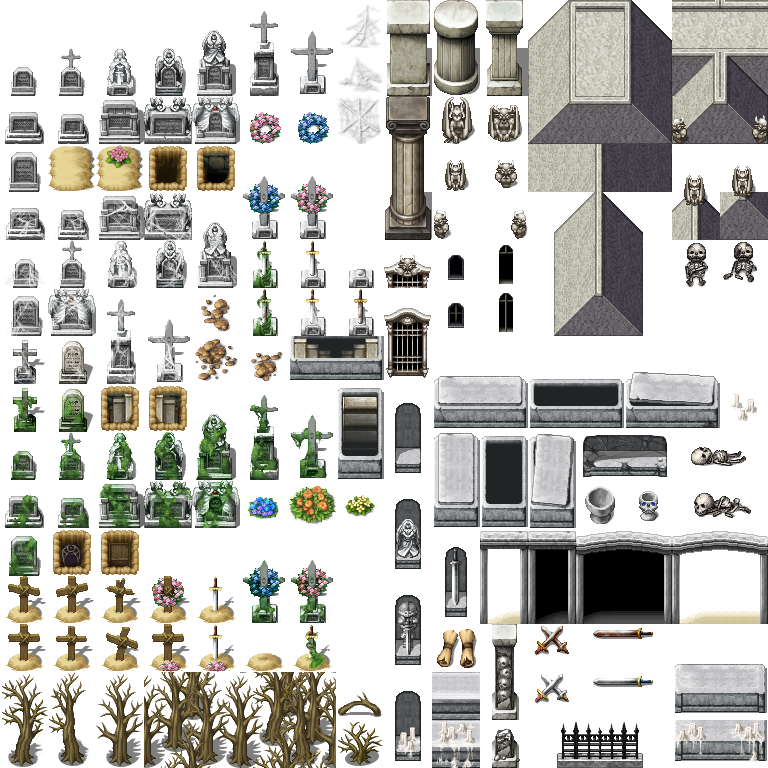 Really there isn't as much here as I would probably like, but I did basically triple the amount of resources for the demon world, and hope it at least gives people insenstives to maybe take a second look at one of the more overlooked sets in RPG maker, and maybe make more content for it. 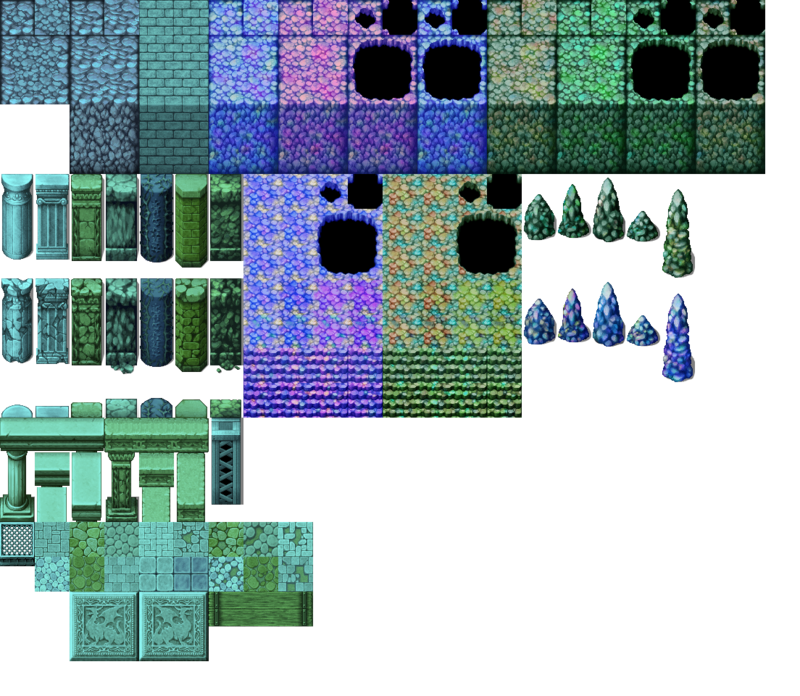 The other tileset of course is the inner body one. I didn't make a lot of extras for it either, but I wasn't satisfied with what little was in the defaults, so I did some expanding on it and hopefully it's a bit more satisfying to use. As you can see, this is a far larger expansion for something that should be in game content. 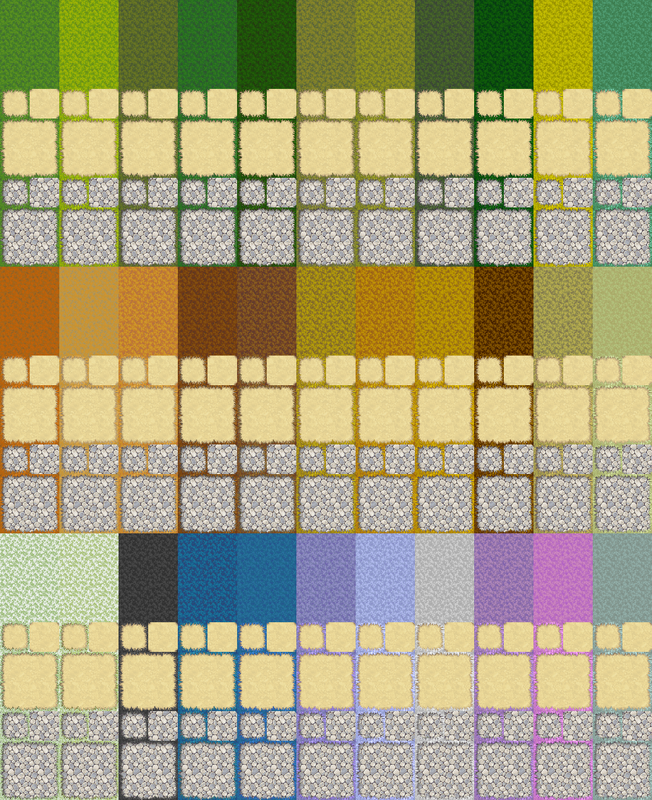 I added a bunch of new ground covers in various recolors. It's not as expansive as the volcano tiles I made by any means, and is lacking a few things I would personally want, but it does have the basics. A decent ground tile, a stone pathway that could lead up to the castle for example, many new recolors for native plants, and some decent water tiles. As mentioned above I wanted this to be almost a beautiful strange world, the idea would be that it contrasts to the far more terrifying things found in the castle. Of course alternatively it could be used for scifi settings in alien planets. This is NOT a tileset, you will need to edit it for your own purposes. 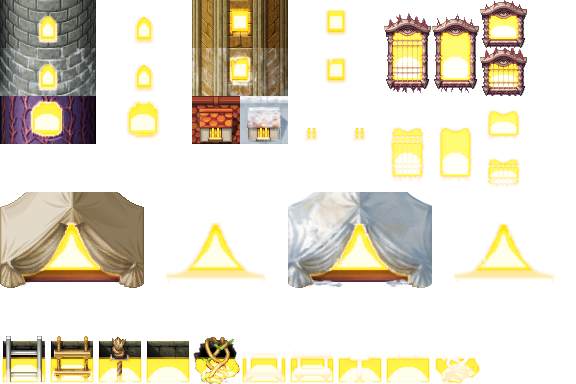 Here are some demon castle recolors and a few expansions. I came like, super close to making a whole new set of furniture just for this but went against it because I wasn't quite sure where to start for that. One of the things I wanted to do was expand on the eyeball floor coverings the default had. I twas the first thing I edited before deciding on going ahead and editing more of the demon world. The default was implying some kind of carpet that was leading up to the final boss. I made it more like a creepy normal floor tile with added eyeballs and even animated them. Yep~ the eyeballs are an A1 based tile and they animate. not very well mind you, A1 tiles are limited and the animation is a bit lame as a result but what can ya do~ Most of this is simple recolors, just adding more variety to the castles. This is NOT a tileset, you will need to edit it for your own purposes. 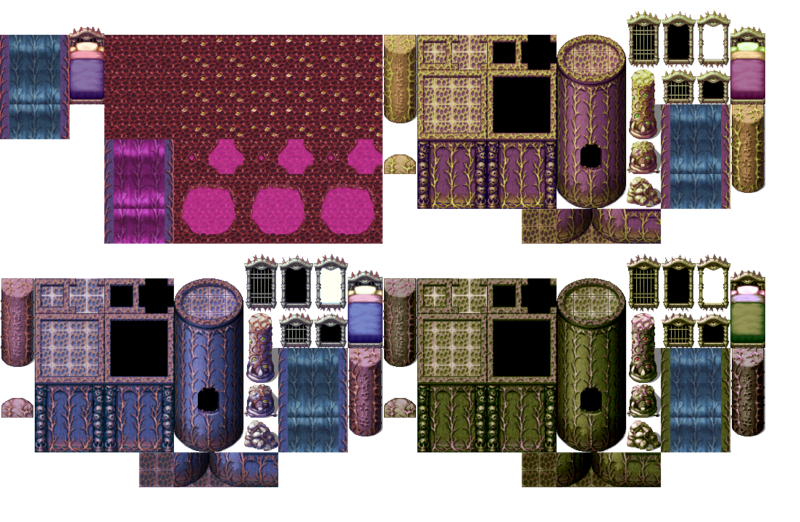 I won't spend too much talking about this tileset, because I imagine of all the tilesets, this is the most likeliest one no one would ask more of, and now no one will ever have to. It is of course the inner body tilesets in all it's grossness. 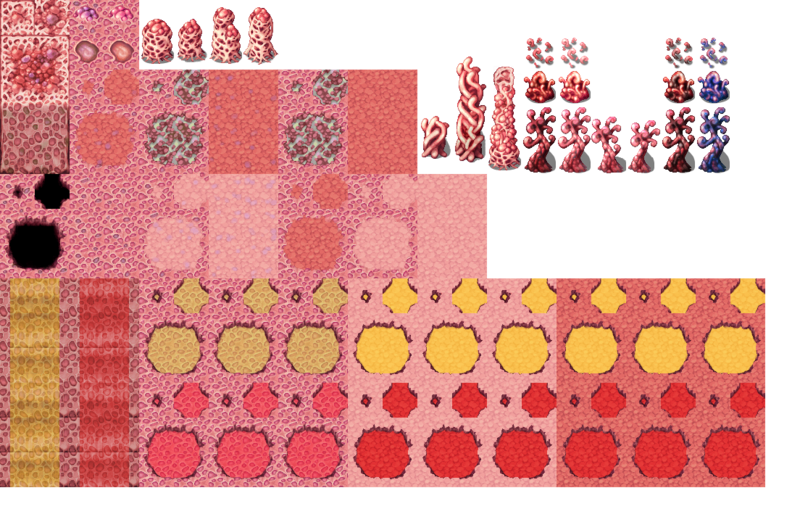 I was a little disappointed it didn't have any kind of liquid tiles that XP's defaults had, and of course I made those, both the XP's original yellow acid looking stuff, and a recolor of red blood stuff. 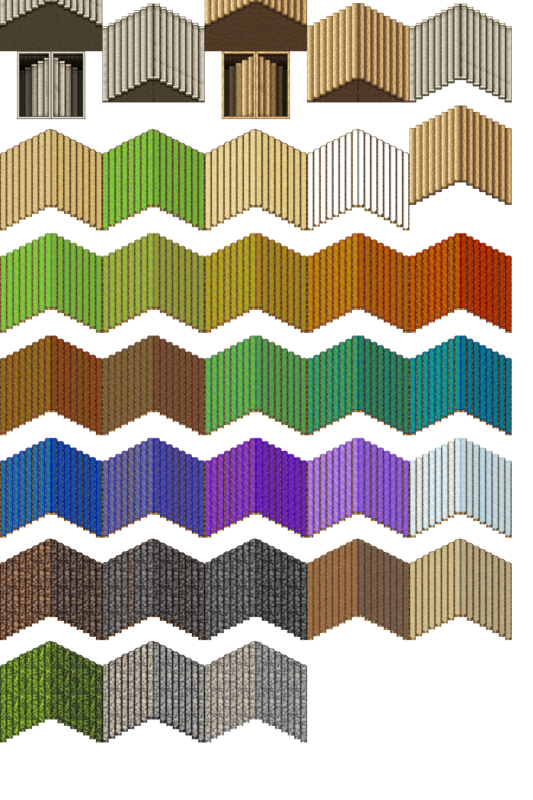 I went through MANY many different variants of colors and tilesets trying to get this one to work with more colors, but it was just not working. Almost everything I tried would end up like a muggy mess, and well I didn't really want to spend THAT much more time messing with these. It IS kind of gross lol. I did recolor some of the demon world tiles to match it better since they all look like something that could work within it. I also added new pillers and more structures just to give some variants. The one major issue I have with this tileset is the water doesn't seem to animate too well. If someone REALLY wants me to change that, I will otherwise it's not really too big an issue. new bodies extension. 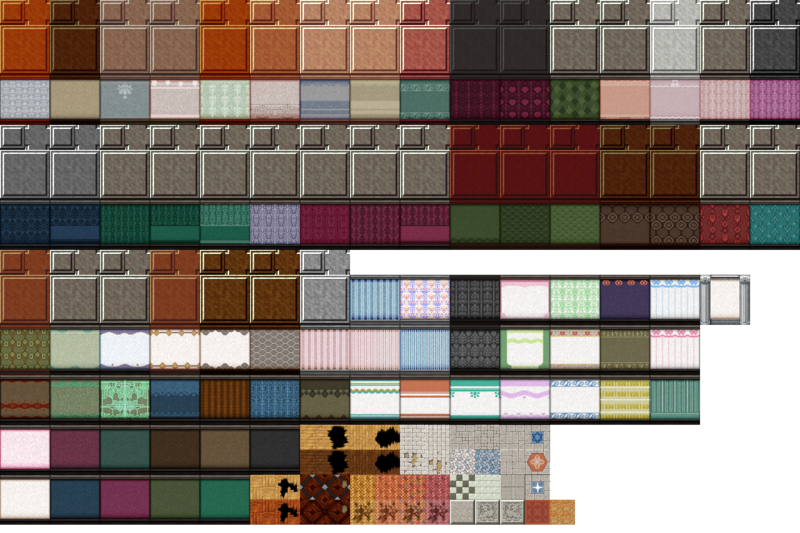 Some of these where made with the help of albert-youkai and their tile edits.  some of these can also be used for alien worlds! 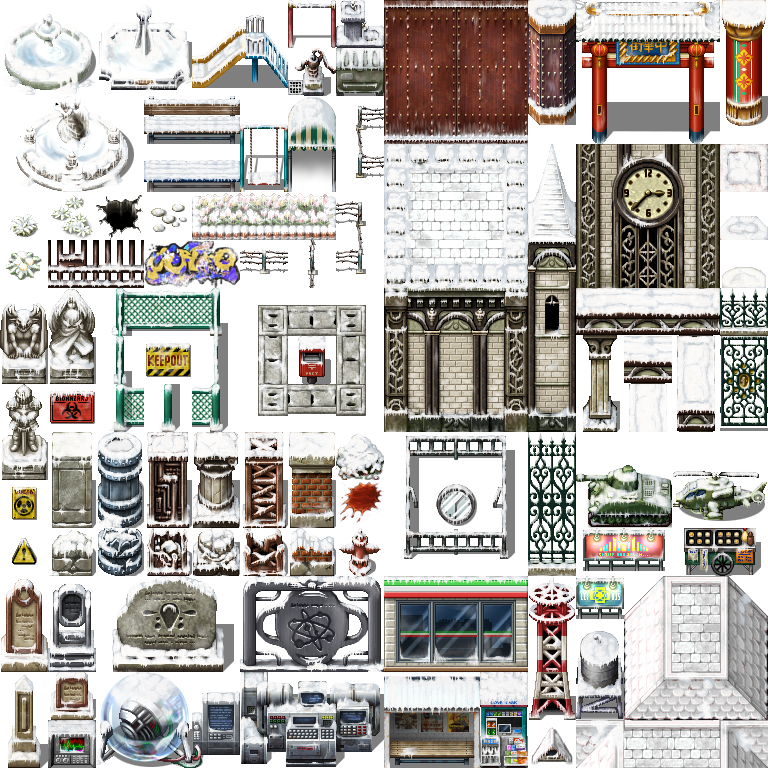 I decided to take some of the default MV tilesets and make them winterized. 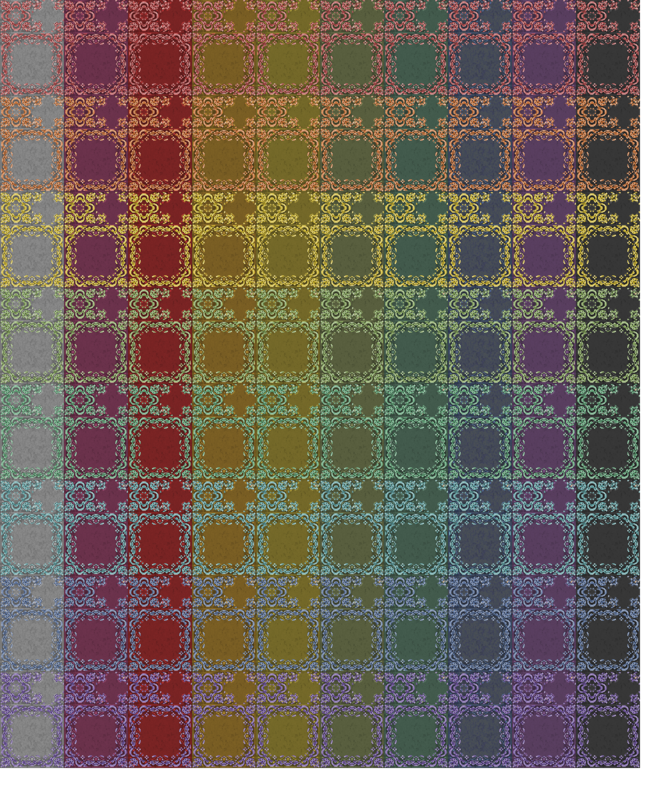 So far, it is only the two modern (SF_outsideB and SF_outsideC) tiles and Outside B. 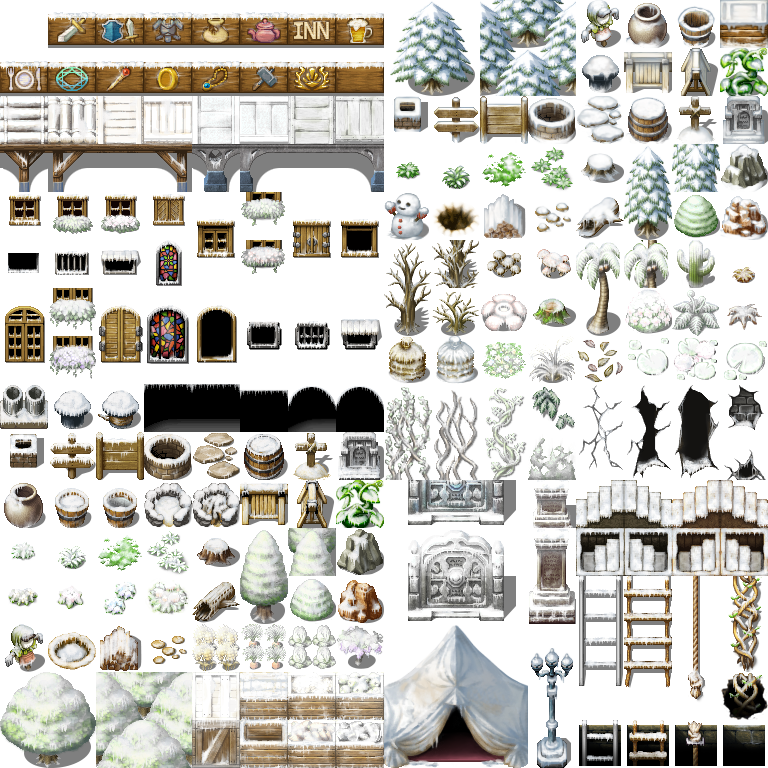 The desert tiles have snow on them, and I DID go ahead and make snow versions of things that already had some snow types to them for a couple of reasons. 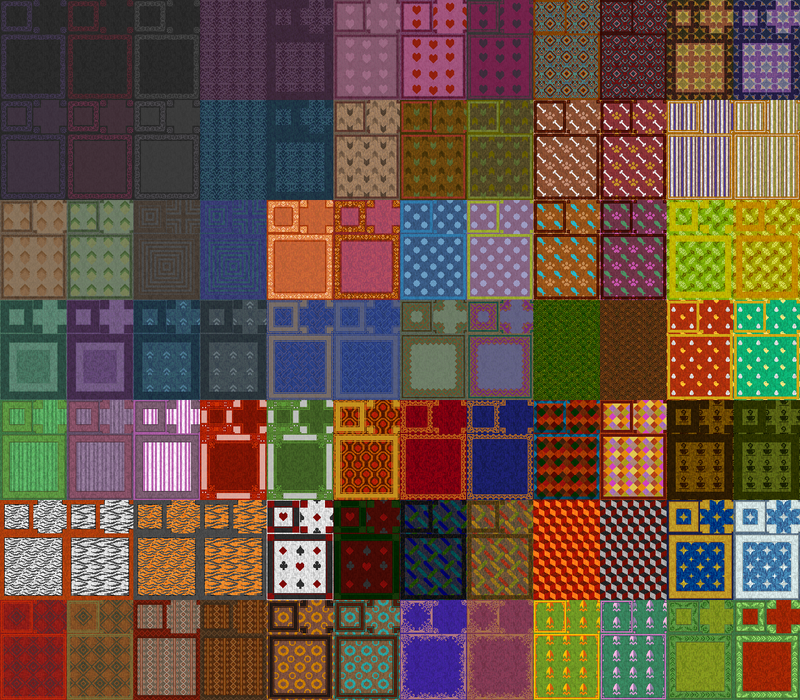 1, so the tiles would match to all the others I made, and 2. so there would be more variants. I do have some other tiles that I'll probably be making winter themed eventually! I posted this one up a little while ago on twitter and on my profile. Since I have a lot of tiles to showcase I can show this one off too! It's pretty basic, the first half is for the outside/graveyard portion, and the right side is ment for some of the inner tiles, but it'll also work well with some outer components. I will be making some more dedicated inner tiles for this eventually, but for now this is pretty okay I think! It's loosely based off of The Zelda series for graveyards where the graves could hide hidden passageways. I also felt like there needed to be more varieties in headstones as well. The dead trees I don't know if they look okay or not, may have to rework those. Because no one is recoloring this stuff, and I think we need to. 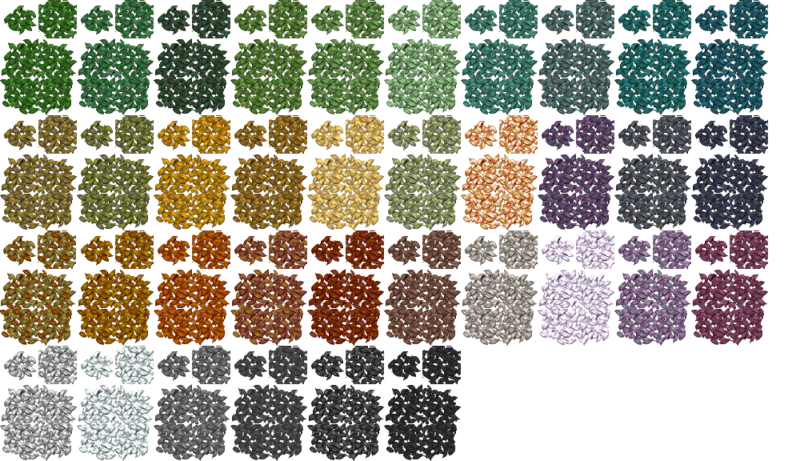 Not only am I covering recolored grasses and dirts, I'm also going to release a lot of flowerbed type stuff. 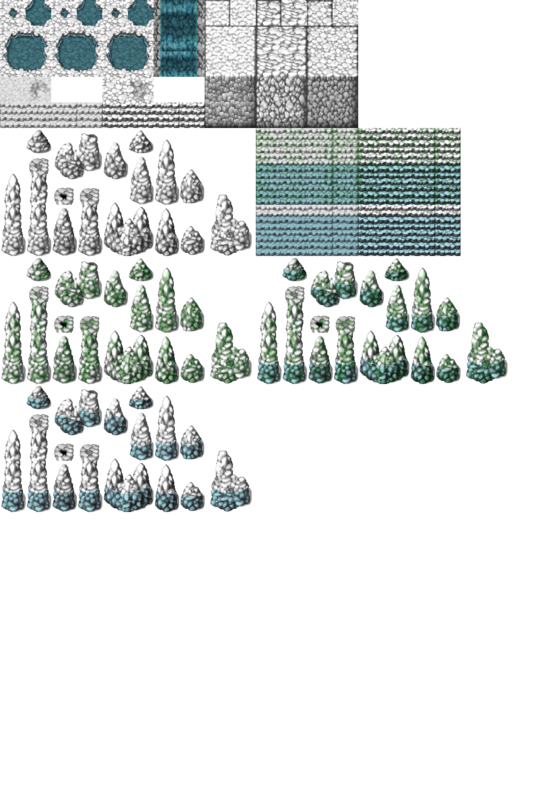 This also includes auto-tiles for leaves and some other stuff I feel like needs to be done. recolored grass with base dirt color! 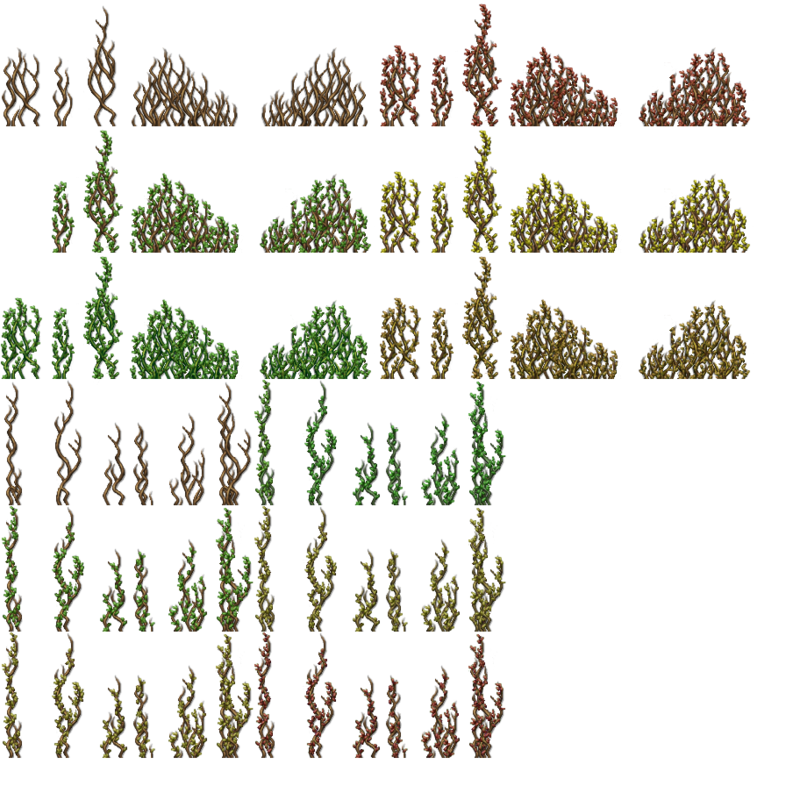 additional/recolored leaves that are in fact auto tiles. This is the one that bothered me a lot because it should have been a thing right off the bat and it wasn't. Can be used for weddings for makeshift flower peddles too! 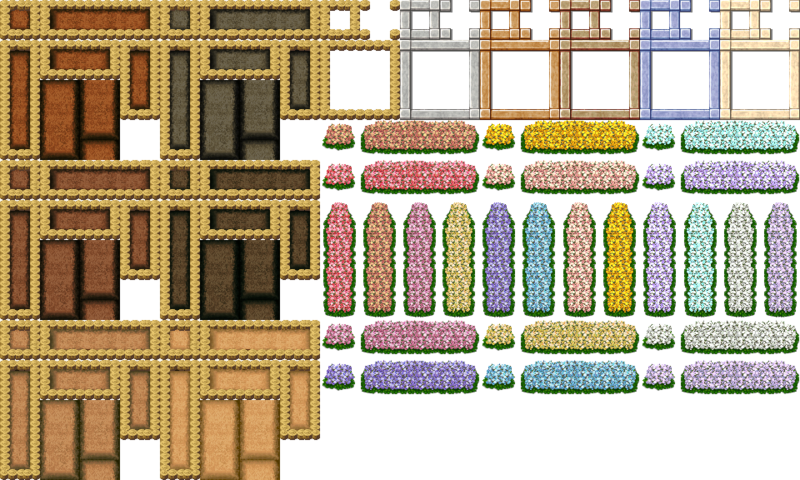 Autotile Flowerbeds, I posted this earlier elsewhere but here's the official upload. I told myself I wouldn't do any building based edits because there's already a ton of those available by lots of people, but I went ahead and did some editings myself. 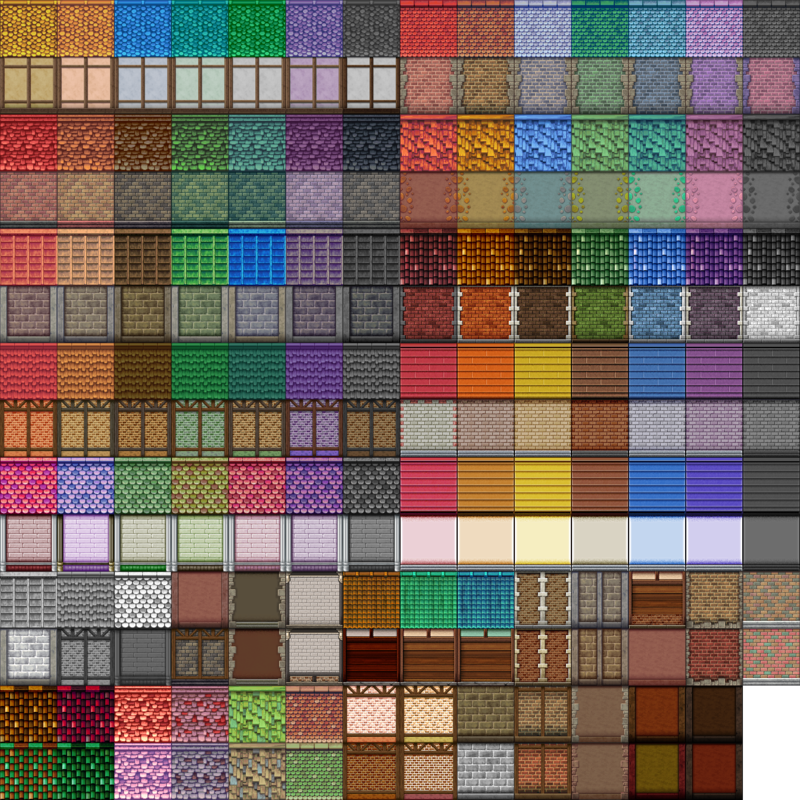 None of these are tilesets, they WILL need to be edited and added in as needed. Walls, Windows, Chairs and Rugs are here for now. Now with extended shelves/store shelves, added kitchen items, TONS of colorful furniture, new furniture items, and new beds both side view and front, small and large and damaged in many colors! 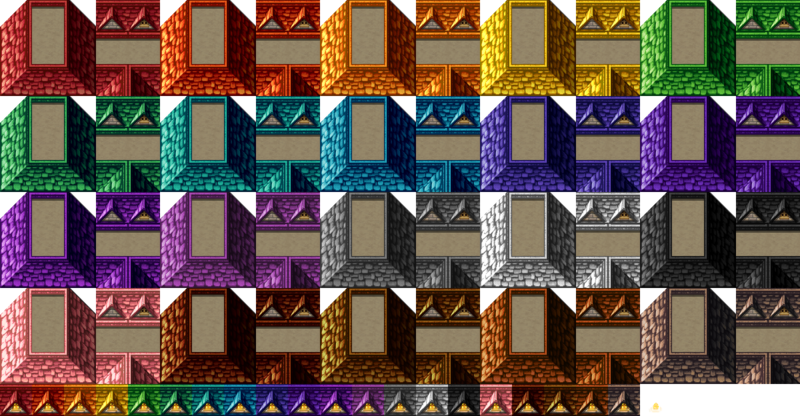 Building/walls-- basically just expanded the color variants by a lot. Black and white variants are also available but moreso for chard/burnt colors. There are some darker toned colors for those that want a more natural/darker toned set. I also included a few multi-colored brick walls and some multi-colored rooftop tiles closer to the bottom u w o;~ yay colors! 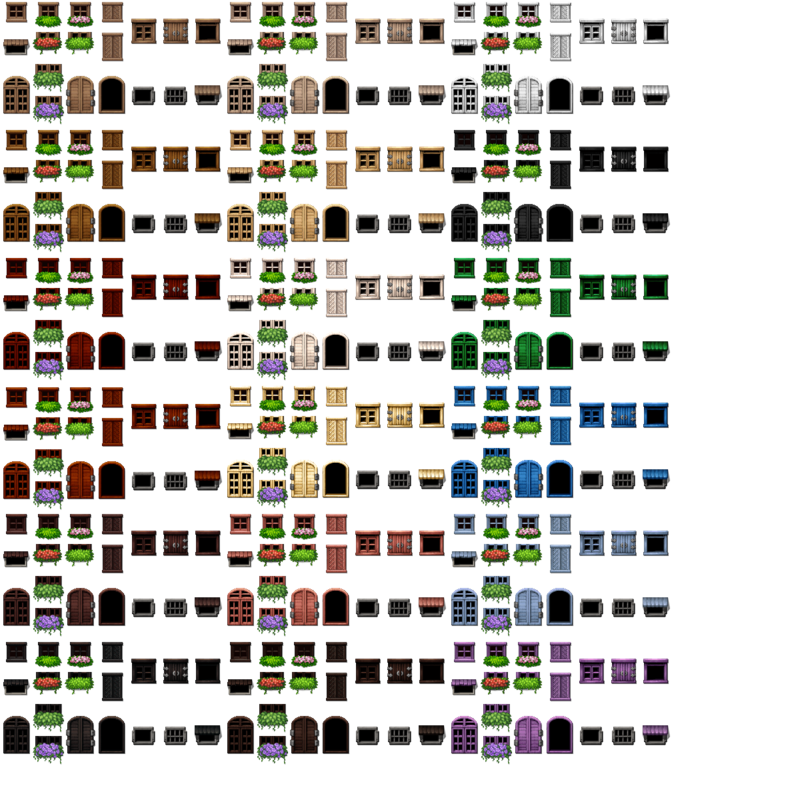 There's also some lighting tiles now for the windows. 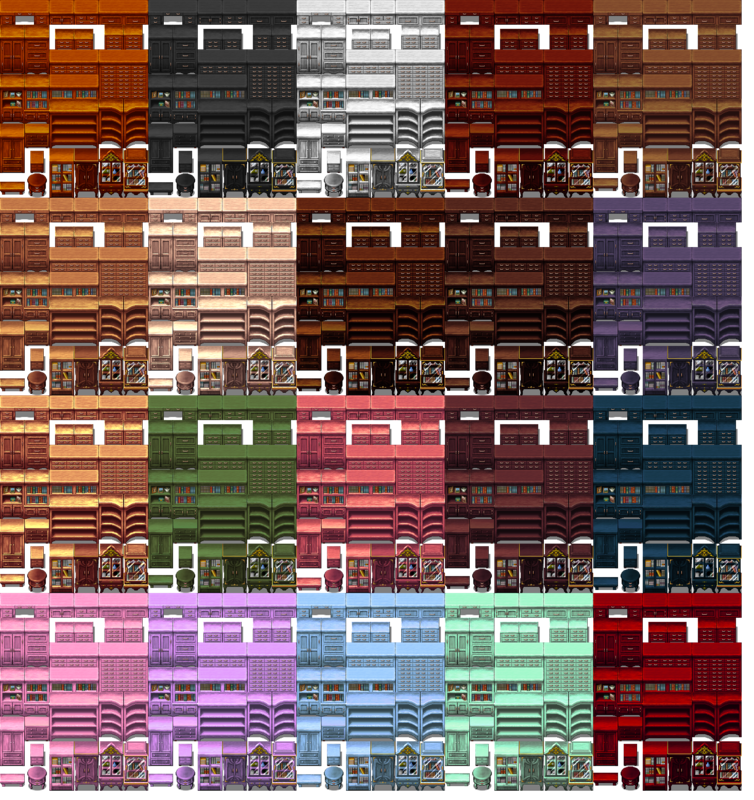 Window recolors are generally more natural wood colors. with a few painted ones. I didn't go too crazy with these in colors mostly because I wanted something that would pretty much go with anything else. 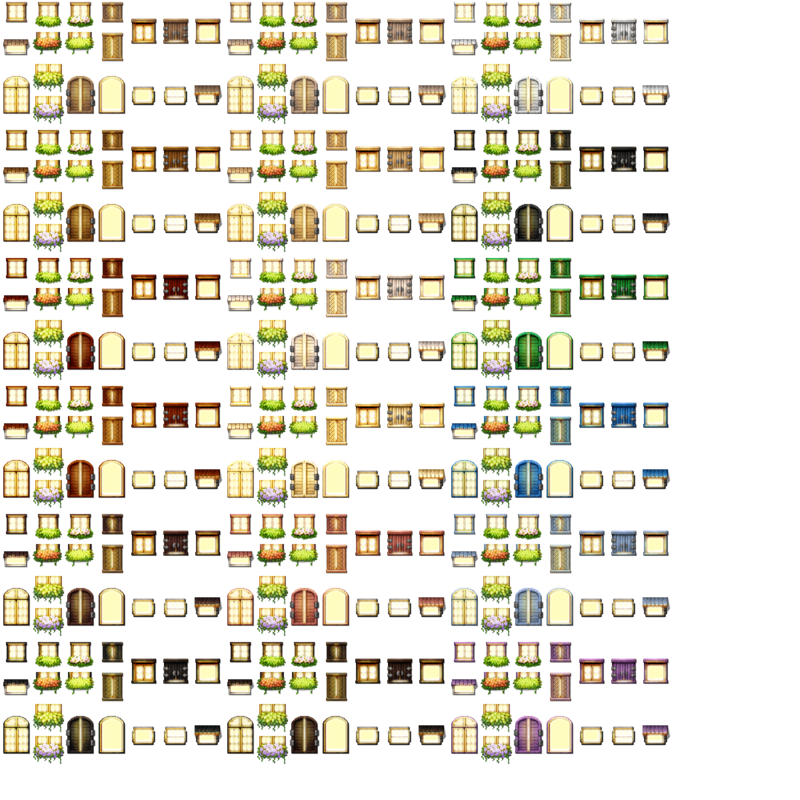 I've seen lots of people do door recolors but I don't see too many recolors for the windows, so there ya go. 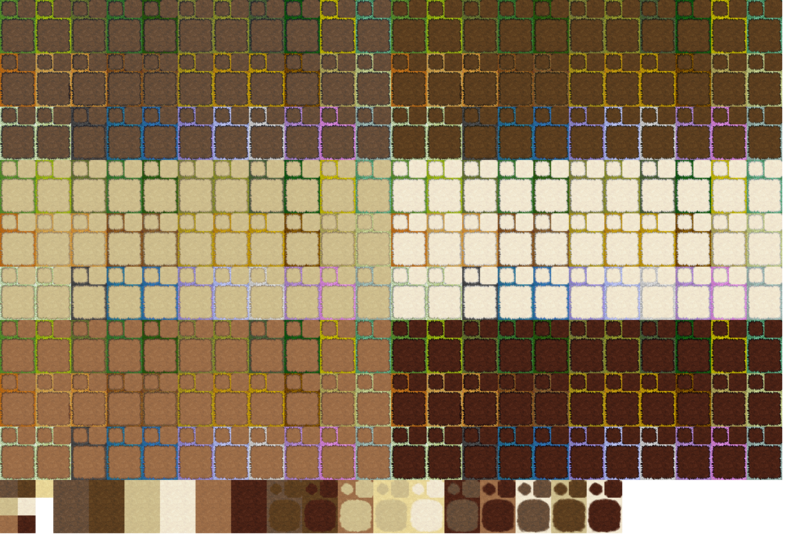 There's a few darker toned browns at the bottom for darker tilesets. General purpose lighting for a variety of things. I posted an early preview of these chairs up a week ago but I've since added more colors. I didn't like the original royal chair in the default tilesets so I've decided to make smaller varients to it. You can see the size difference up in the upper left corner. 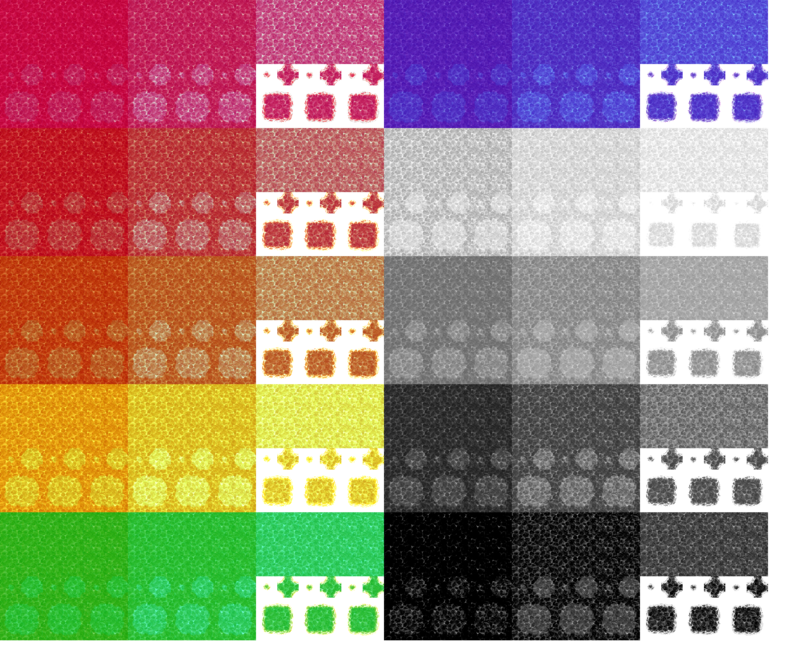 I decided to leave a lot of my edited trimmings so anyone can make more color variants if they so wish because I realize that that there could potentially be thousands of combinations for everyone, and I just wanted to make it as easy and painless as possible. I also decided to make other chair types because sometimes you just don't need a super fancy embellished chair. looking back on it I probably should make side and back versions of the other chairs because they do look like fancy dinning seats at least, but I might do that later down the line if there's enough interest for them. made these awhile back --forgot to upload them! here they are! 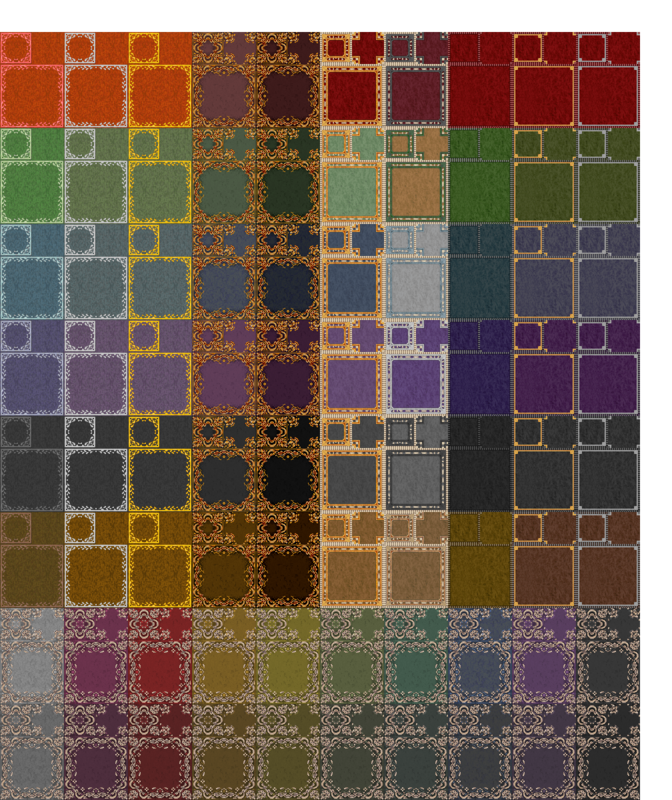 another set of tiles I didn't upload sooner. Here they are! 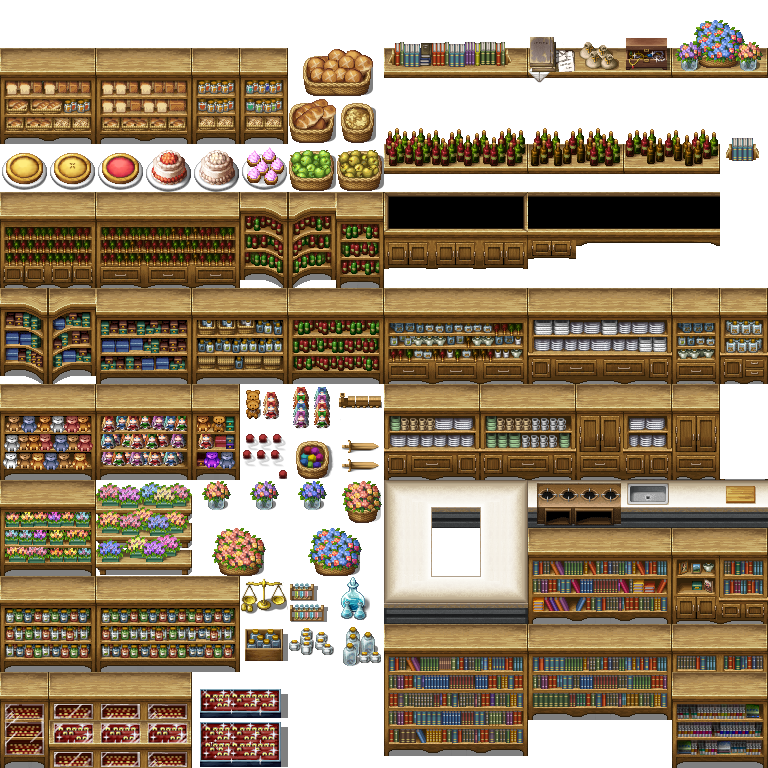 Nearly complete Tileset for new store shelves to extend shops, includes new variants for bakery, new baked goods, bottles on shelves, more kitchen shelves for restaurants or a massive kitchen, larger extended stove expanded kitchen counter for new shapes. New toy shop, flower shop, medicine shop, and jewelry store items, and expandable bookshelves for libraries or large rooms! 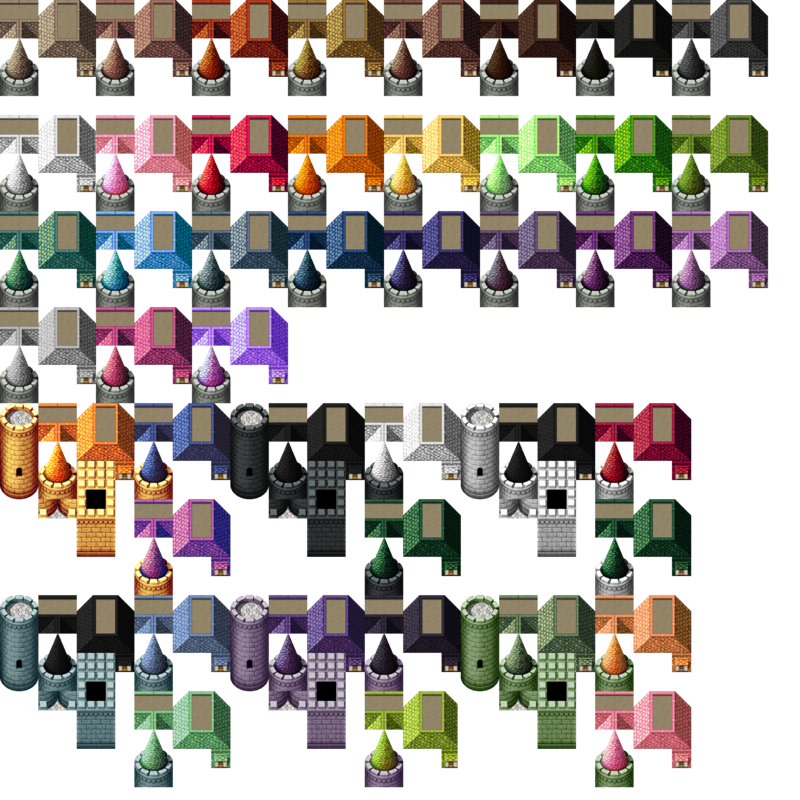 Massive recolors of various furniture with some smaller added furniture bits to help fill out rooms more. Comes in a variety of colors. I tried making it so everything would match with each other so you can color coordinate things better and they can at least look like they are somewhat matching with each other. If you notice, some of the modern tiles are now more closer to the other shelves in terms of colors so they don't clash so much being used together. This is NOT a tileset, you will need to edit what you want from it. 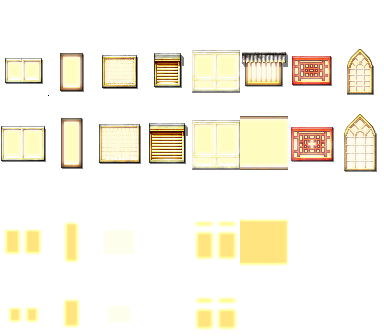 Extended beds, for both small and large sizes, side view, and damaged variants. 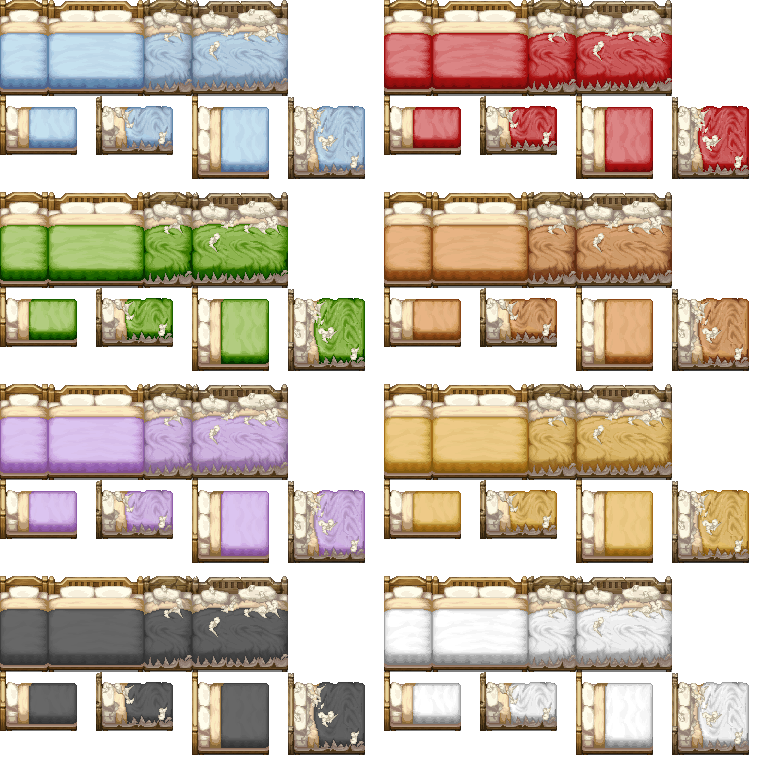 Beds needed recoloring and that is what I set out to do. Comes in a variety of colors, I almost added in beds with patterned quilts to them but I decided against it for now-- this is really just being able to get these out there for general use. I'll probably add new patterns to the sheets later. I might as well make a new catagory since this will be a thing soon! Will be featuring all sorts of dungeon based tiles hopefully. The Treasure Room is currently available. Treasure Room: I've been meaning to finish this one up for awhile now, but I wasn't sure how much more I could add to it. 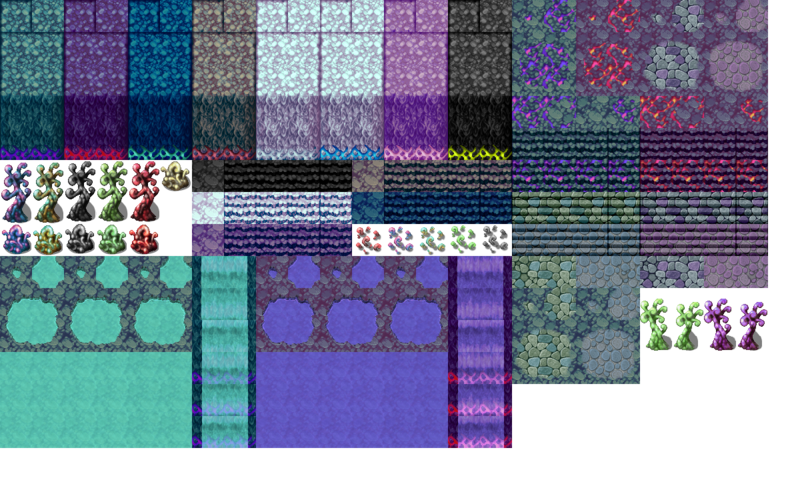 This IS a nearly complete tileset. 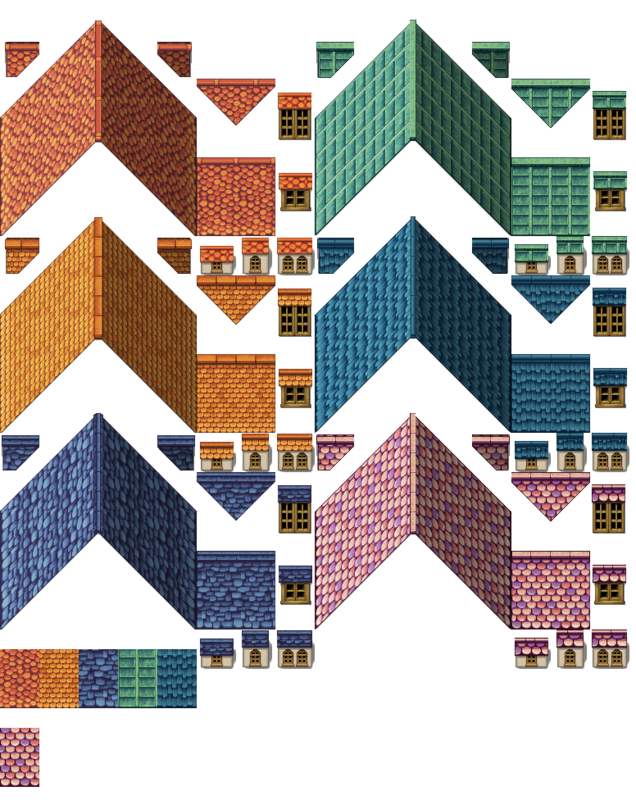 No editing required, and I'll be trying to do that when it comes to these dungeon tiles if I can. 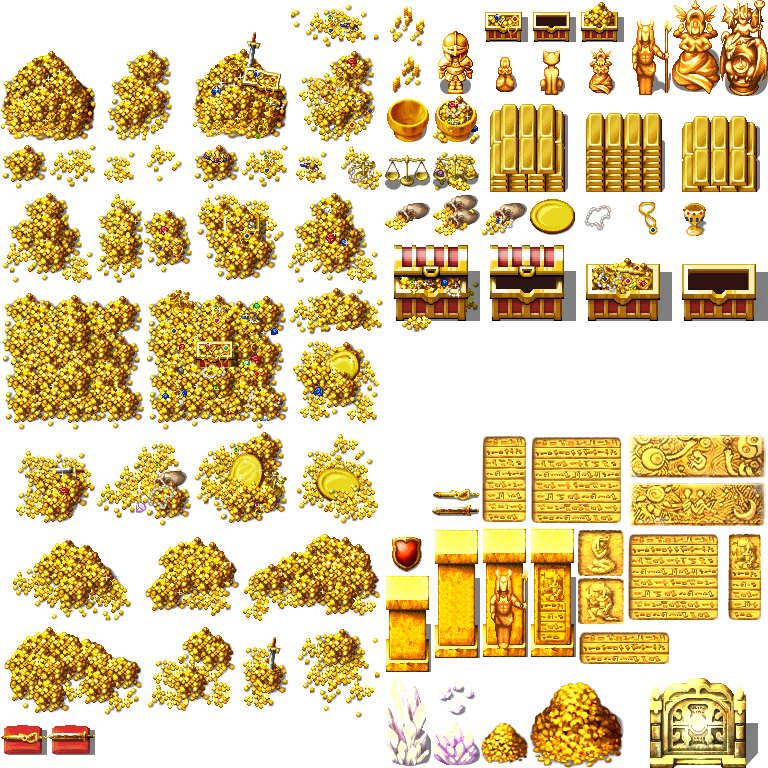 Extended Gold resources: This isn't technically part of the treasure room, but there's enough overlap it can be used. There's three major parts of this. First, Autotiles on the left side. Below the autotiles is a bunch of gold that's half submerged in water. They are half transparent so they should work with most water types. 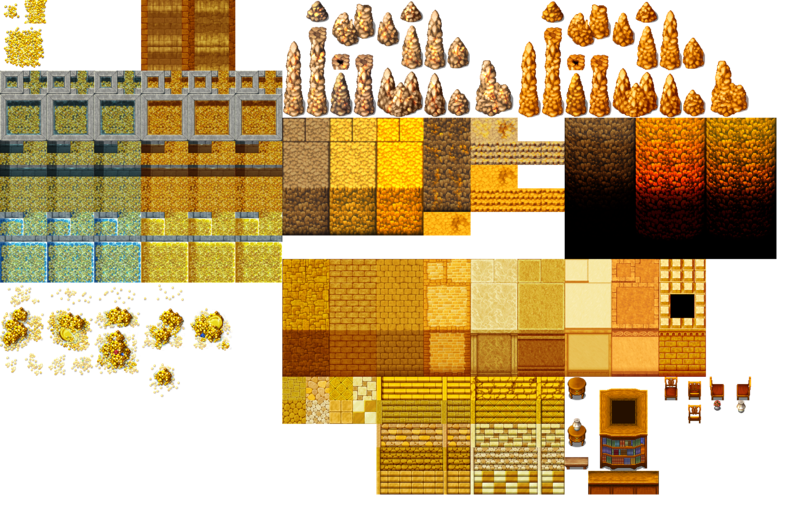 The second part, on the upper right side is cavern tiles and the third below that is gold walls with some matching furniture. These are NOT for use in game. These are 100% purely for editing purposes to change, edit, addon, remove and recolor. Currently only seabed stuff is in here because given how little there is to work with as far as underwater goes, I felt I should at least offer these up for anyone that wants to build off them. May, 2, 2016; added tons of grass recolors, dirt recolors, and some new flowerbeds, both non auto-tiled and auto-tiled. June 29th 2016; added building walls, rooftops, chairs, and rugs. Angel.K1tty, Epic EP, XPKobold and 169 others like this. Spider webs! Just what I was looking for (well, two weeks ago, but hush)! Awesome! There is so much here, you could create like 4 dungeons purely with this awesomeness! I love the blue colours that you use, especially the auto-beach-tiles and the blue volcano ones which I really really like! Oh and I really like the flooded lavastairs, but it looks a bit odd when the lava isn't animated since it looks a bit frozen. It makes me wanna do a "run from lava flood" section, just need to figure out how. These are absolutely incredible, thank you! The spiderwebs look awesome. I was in need of this exact resource for a map I'm working on. Thanks for sharing! I seriously have no words, those tile sets are absolutely incredible. The seabed has to be my favorite. I'm so drawn to the colors and I think they could do double-time and be great for alien worlds or otherworldly maps. Fistbumb. The lava staircases are ment to match the lava floor tiles, not the animated ones o 3 o since none of those animate, I figure it'll be fine. Having said that though, I know of one easy way to kind of animate them, just edit the lava portions so they're semi-transparent and then add a parallax background that moves slowly. SkySurfer, flirion and Ghost of Christmas Kloe like this. another one that I was particularly annoyed by was a lack of autotile leaves, which I've fixed along with several color variants. anyways enjoy /o w o/~! The Stranger, Roguedeus, flirion and 2 others like this. 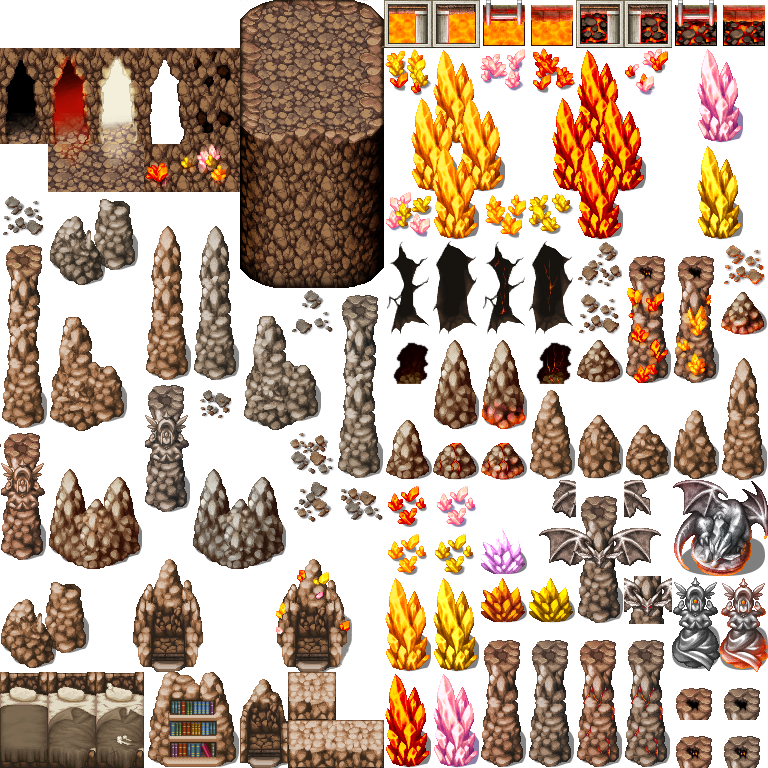 @whtdragon would you consider making some tile edits for ruins? Typical stone outdoor tiles with cracks, crumbled walls, broken statues, etc... ? I didn't know, you had a thread for tile edits, too. I really like the Volcano B tileset. That bookcase inside the stone is genius! Insanely good work, as always, whtdragon. These leaf autotiles will certainly come in handy! I think your work is amazing! I Love it! Well, if you're looking for suggestions, I'll have to second Roguedeus. A ruined/decayed RTP would be amazing. An interior balcony, something like this, perhaps? More statues? Massive, dead trees in the RTP style? 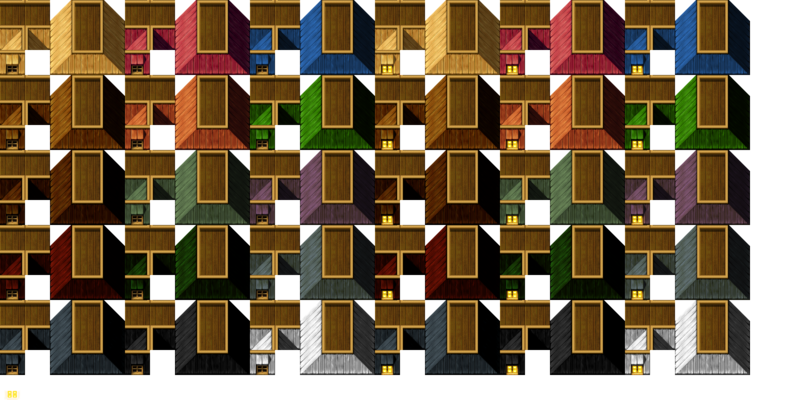 Or more shop-type tiles, like shelves filled with variations of the same item, like a shelf full of different colored potions, etc. Nice selection of inner body tiles! Now someone could make a Fantastic Voyage type game if they wished! Is there a download? If not, Can you add one? Simply amazing stuff. The underwater set is fantastic. I appreciate the effort that has to go into some of this even more. Great work.